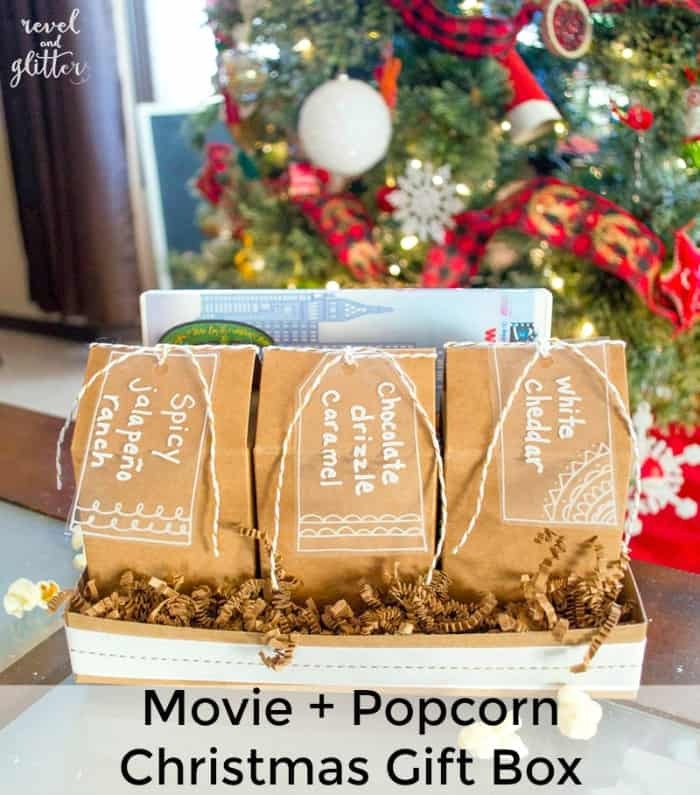 This Movie and Popcorn Christmas Gift Box idea is courtesy of our contributor Dawn of Revel & Glitter…Christmas shopping is in full bloom. From family and friends to neighbors and teachers, you probably have a list of people to get things for a mile long. Let me help you cross one of those gift ideas off your list with a Movie and Popcorn Christmas Gift Box. It is a great way to give the gift of an afternoon of movie watching and popcorn. You can tailor your popcorn flavors and movie choice, or even fill the little boxes with other movie watching treats like candy or mini cookies. What I like about using popcorn, it is perfect for those who have gluten allergies. Paired with our all-time favorite holiday movie, Elf, you are ready for a great movie-night in. 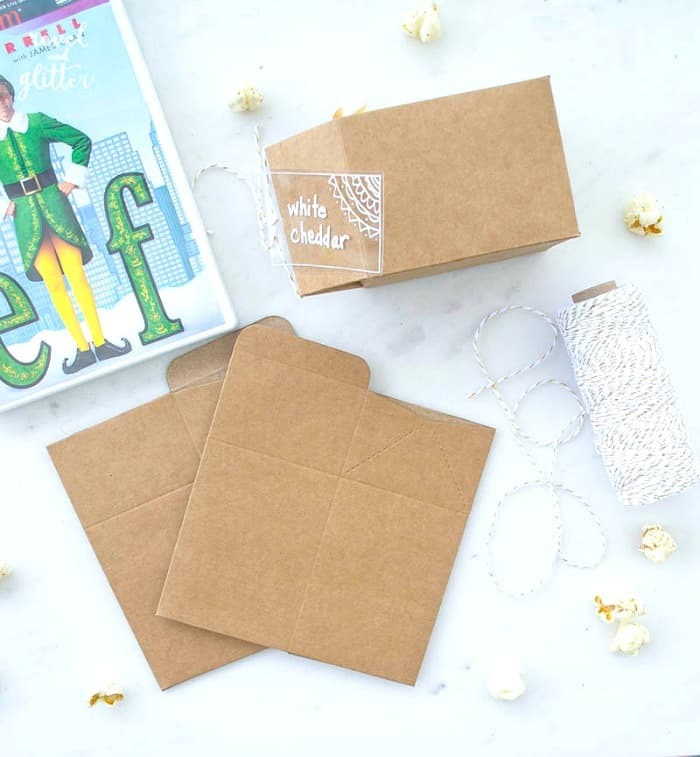 To create the tray, trim the kraft box down to about 1 ½” tall, then adhere the ribbon with double sided tape or dry adhesive. Assemble the milk boxes if needed and fill with your treats. My boxes are lined against spotting, so if your boxes are not, you will need to fill small bags with your treats, and then add the bag to the box. Write what is inside each box on your acetate tags with the white marker pen then attach with bakers’ twine. 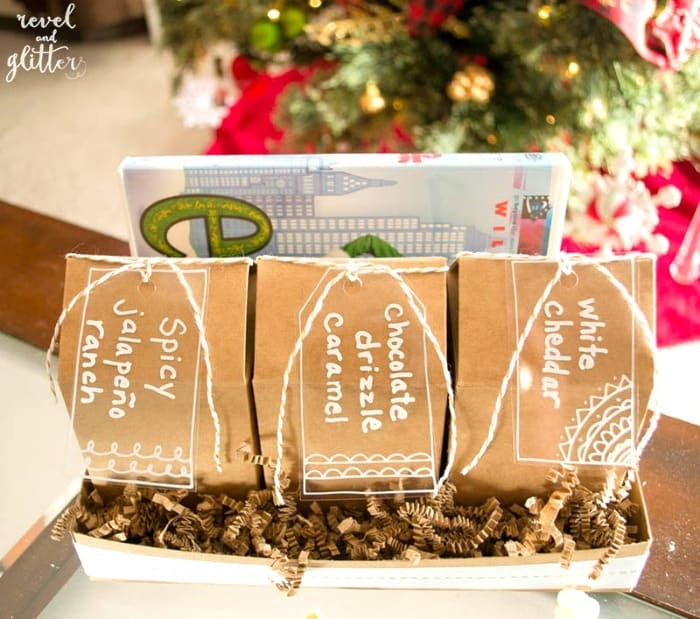 Add the milk boxes and movie to the box tray and then fill the space with paper crinkle. 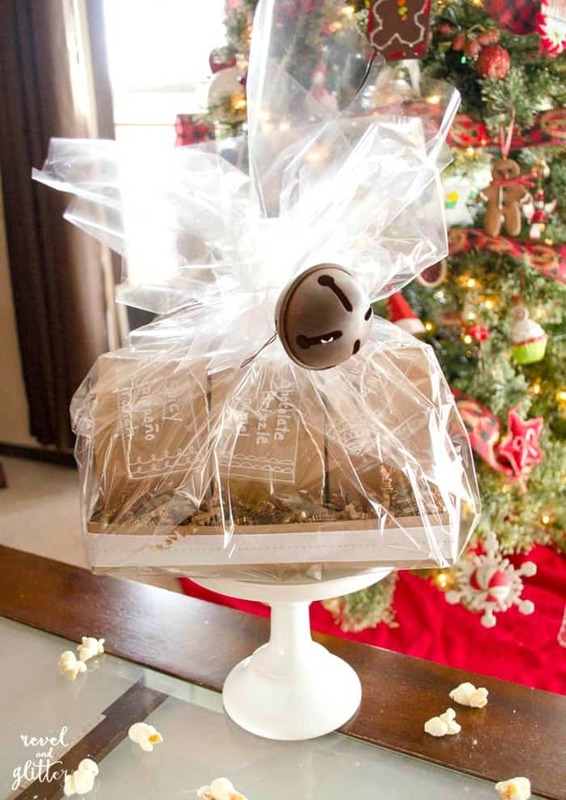 Wrap up in a piece of cellophane gift wrap and finish with ornament. I think this is a great twist on the traditional movie theme buckets…I hope you are inspired! Need more Christmas gift ideas? 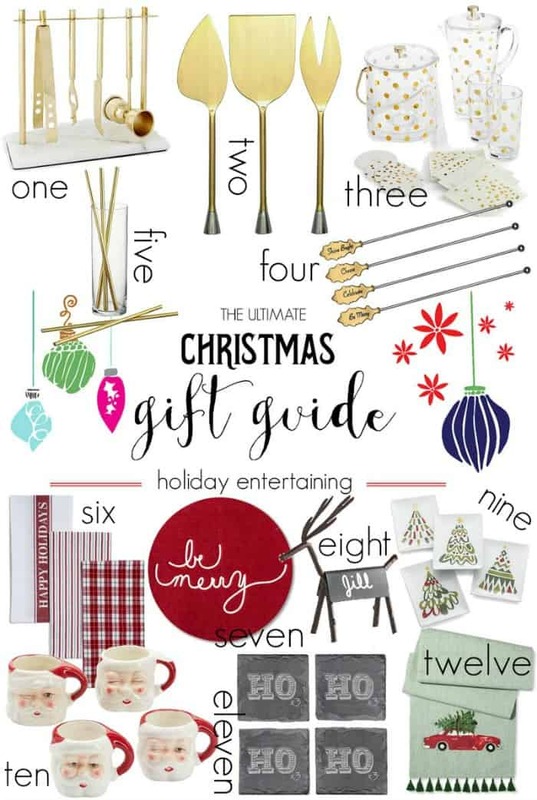 Check out a few of my Ultimate Christmas Gift Guides. We’d like to send a big THANK YOU to Dawn of Revel & Glitter for sharing these fun ideas with us. Over on Dawn’s blog you’ll find plenty of party ideas for all of life’s celebrations. I hope you’re ready to plan a party because she’s sure to leave you inspired! Be sure to follow her on Facebook, Pinterest and Twitter for even more creative ideas.